Later on, this balloon floated from the hallway, ducked under the doorway, and headed straight toward my little one and I as she read a book and I dried her hair on my bed. She giggled so hard as it drew near. Now, I was blow-drying her hair and pumping lots of air right in the direction of that balloon. There's no natural reason why it would come right up to us, even touching our cheeks!! We marveled and it blew on back out the room, ducking under the threshold, and curved around down the hallway to check on my other little one. It didn't bump into anything. Just moved on it's own. Ever think it's actually the angels who are entertaining you, instead of the other way around? That night, I have no idea how the balloon ended up in my prayer closet. It was bopping around over my prayer list. I decided to believe that God is behind this and followed the balloon as it pointed to different points. My friend and I share the same list. She asks God to highlight what she needs to pray. So I figured, I would just go with this and let the "balloon" lead the way. I prayed for a bit as it slowly moved from one item to another. Then it drew near, right up to my cheek. And nuzzled against me! A day or two later, this balloon follows me into the kitchen where I'm working. "Surely, goodness and mercy will follow me forever!" -Psalm 23:6 whispers in my mind. The Lord our God can do ANYTHING. ALL things are possible with Him. He's extravagant in the ways He beckons us to come. And He's tender and kind. My prayer for you. Join me? Lord, I ask that you take the heart of this reader today. Holy Spirit, anoint these words they read and pray. Open their eyes to see and their ears to hear. Lord, show them that You speak and move and lead in infinite ways... through donkeys, license plates, a bush on fire, hearts in onions and rocks, in numbers, in roses, in glitter... You show your children you are with us in infinite ways. We praise you God! We love your creativity! We love your tenderness! We love how you use symbols and repetition and confirmation. We love being your kids. I pray for holy joy to come over this reader today! I pray that you will surprise them with your goodness and mercy. Give them ears to hear and eyes to see it, in the unique way you show it to them. Develop in each of them a sense of wonder and awe at your ways, so much bigger than our ways. 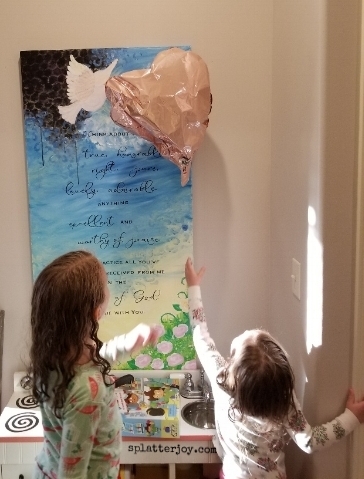 Develop in them an assurance that surely Goodness and Mercy follow them and go before them to lead the way, like that heart balloon, all the days of their lives.